The archaeology of gaming is fascinating because we’re dealing with both a material and digital object. As archaeologists this puts us in an exciting position, because in other areas of research (rock art studies for example) the social meaning of what we’re studying is lost. This article about 1980’s gaming and computing software also shows us how we can apply archaeological methodologies to more recent technology. This paper also made me think a lot about the relationship between the material, digital and social aspects of technology. Methodologically the paper discussing some of the technical aspects of archeogaming; namely copyright software and how to crack it. Aycock and Reinhard point out that copy protection is as much a part of the artefact as the artefact itself; the authors compare this to Mesopotamian bullae to remind us that cracking an objects protective packaging is an idea as old as history itself. It’s worth noting here the debt that archeogaming owes to “crackers” who have worked their way through old copy protection. Though doubtless an annoyance to copyright holders, it’s probable that a lot of abandonware products would be uninterpretable without them. Likewise, unlike other archaeological objects, studying retrogames also requires consideration of copyright to acquire and study the software. 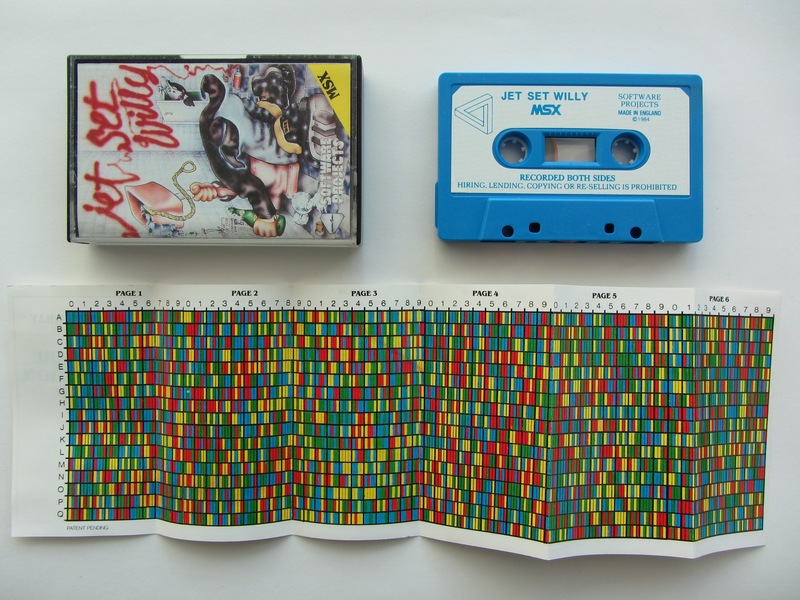 For Jet Set Willy, the method of copy protection in the form of a card folded into the cassette, is a separate artefact in itself. This technique, was based on an algorithm within the game code and with “Patent Pending” typed around it. By all accounts the colour card form of copy protection didn’t catch on much beyond this game. The paper goes on into an analysis of the algorithm and its accompanying code. I’m not enough of a techie to provide much comment on these aspects of the paper. I was, however intrigued by the discussion into trying to find ‘authentic’ copies of the game to study, as many online versions or copies will have been altered and had there copy protection removed. Online versions of the game are also alienated from their physical format (a version is available on the Internet Archive if you ever have a free afternoon and wish to indulge in some 80s nostalgia). Overall this paper also brings in evidence and observations from non-traditional sources, like the internet archive. Aycock and Reinhard rightly point out that Jet Set Willy is not a re-occuring subject in most scientific journals. Harrison, R., (2009). Excavating Second Life. Journal of Material Culture 14 (1). Vol 14(1), pp. 75-106. https://doi.org/10.1177/1359183508100009. The ADS entry for this article leads to a downloadable PDF version. The archaeology of virtual settlements does at first glance sound like an oxymoron, as may heritage when it’s applied to the same concept. This is quite a theoretical paper, bringing together ideas from sociology and anthropology as well as heritage and computing. In this paper however, a settlement is not defined so much as a physical space but as an aggregation of persons with shared ideas forming a community, I find that an interesting point in itself as we apply can a similar line of though when discussing archaeological settlements or “social landscapes” (discussions about British prehistory come to mind for example). A lot of the article is dedicated to an anthropology of Second Life and its users and why the game was so significant in the late 2000s. I’ve never played Second Life so was amazed to learn how gamers have adopted and appropriated concepts of heritage and conservation into their virtual world. 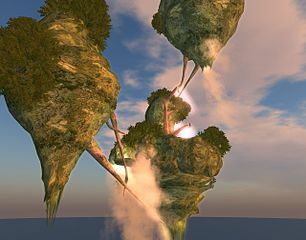 Like much of traditional [Real World] heritage, the conserved sites in Second Life focus on upholding and preserving local origin myths. Harrison actually summarises several points of heritage conservation in Second Life that could be applied to any critique of heritage in the real world (p.80). the ‘Why?’; as in ‘Why heritage conservation in Second Life?’ is answered by the fact that this virtual universe changes very quickly, and the creations within it are often unique virtual objects that couldn’t exist in the real world. The game also contains virtual models of some of the worlds major cities and heritage sites, it might be interesting to compare these with virtual reconstructions built by heritage professionals, the latter being made for mainly educational purposes, and the former for entertainment and artistic reasons. Harrison also takes into account how ‘real world’ mechanisms such as gambling laws, power structures and the exchange rate impact the virtual environment. Among his conclusions is the fact that something does not have to be old to be considered of heritage value; a sentiment that we could also apply to the archaeogaming paper. Also interestingly Harrison describes Second Life heritage as tangible, as it describes objects such as mansions and museums despite existing in a virtual environment. Personally I’d never thought about how this distinction could be applied within virtual spaces. Even for non-Second Life players this is a great paper for people who wish to think about how we apply heritage theory in the digital world. Holtorf, C., (1999). Is History going to be on my side? On the experience of writing and submitting a hypermedia PhD thesis. Internet Archaeology 6. Digital Publication theme. Vol 6, https://doi.org/10.11141/ia.6.2. Even though CD-Roms are no longer in use I still find this an interesting paper in how archaeologists should always try and embrace the potential of new media technology and the potential that new media offers in presenting data in non-traditional formats. Huggett, J. W., (2012). Lost in information? Ways of knowing and modes of representation in e-archaeology. World Archaeology Special Issue. Vol 44(4), pp. 538-552. https://doi.org/10.1080/00438243.2012.736274. A discussion of the relationship between data management, presentation and archaeology.